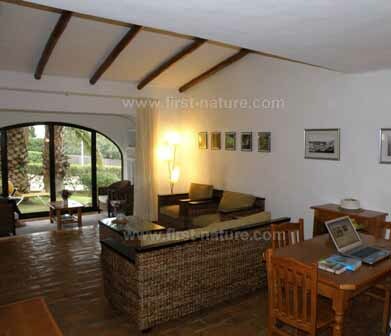 Casa Borboleta is in Carvoeiro, a small fishing village near Portimao in the centre of the Algarve. Casa Borboleta is a fully equipped, two-bedroom, two-bathroom town house, suitable for a family of four or two couples, situated in the peaceful resort of Monte Carvoeiro. The house has been completely refurbished and has a modern kitchen with a dishwasher and washing machine, and two shower rooms/toilets, one of which is en suite to the master bedroom. 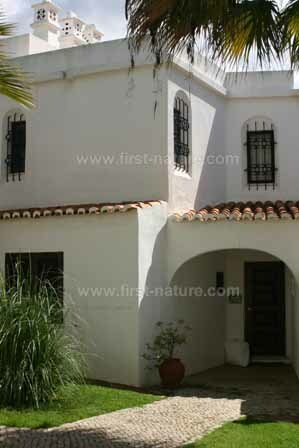 The house is surrounded by attractive communal gardens and has a shared swimming pool with sun terraces. During your visit the house will be fully serviced with towels and linen, and a maid visits twice during the week. The Resort of Monte Carvoeiro is fully developed and completely free of ongoing building projects. The Reception area for the resort is manned 7 days a week and there is a medical centre, a cafe and a small shop just outside the main office. There is also an Italian Restaurant, Mama Mia, in the Reception area which is open most evenings for restaurant meals or take-away orders of excellent pizzas. It changed hands in 2013 and has become extremely popular so booking is advised. Immediately adjacent to the house is a delightful small square with a number of bars, cafes, restaurants and a Jazz Bar. Of these we recommend O Salmao which serves consistently excellent food. 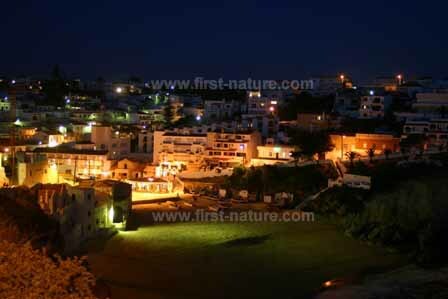 Carvoeiro village centre is only a short walk from the house. It has two lovely beaches and a full range of shops, supermarkets, banks and restaurants, cafes and bars. There is a Tourist Information Office in the main village square by the town beach, and there are also local car hire offices and a Post Office in the village centre. One of the best and longest established restaurants in the village is Maxime which is ideal for a special treat. Newcomers to the restaurant scene in the village are Ele and Ela and Taste both of which are also highly recommended. Booking will be necessary for these three restaurants at the busier times of year. If you like Indian food there is a small Indian restaurant and takeaway in the town, O Indiano, which serves excellent food and offers friendly service. Slightly further afield is Bon Bon which is situated near the water tower at Sesmarias - about a 5 minute drive from the house. Bon Bon is a fine dining experience at a fraction of the cost that it would be in London. The service is friendly and helpful, it has an excellent wine list and the food is absolutely delicious. Carvoeiro is centrally situated on the Algarve coast, and is a great base from which to visit the many wildlife sites, natural parks and reserves of the Algarve region. Both the main N125 and A22 (now subject to tolls) roads are within a few minutes drive of the village. If your interest is in wildflowers and wild orchids then springtime is the best time to visit. From February onwards the displays of wild flowers are fabulous, and by the end of the month with increasing hours of sunshine and rising temperatures the first of the wild orchids come into flower. March and April are the peak flowering months for most of the Mediterraneans species of wild flowers although flowering time is delayed by a couple of weeks higher up in the mountains. Peak flowering time is also a good time to visit for those who are interested in the numerous fascinating insects that live in the Mediterranean Region. Brightly coloured butterflies and moths are particularly numerous and can be seen flitting from flower to flower as they seek nectar rewards for their assistance with flower pollination. In autumn, the Kingdom of Fungi takes over, and both woodlands and grasslands are bristling with numerous species. Because frost is almost non-existant in the Algarve, the parade of fungi lasts right through December and well into the New Year. Spring and Autumn are the best time to visit for birdwatchers interested in passage migrants which travel back and forth between their wintering grounds and breeding territories. Summer is best for enjoying the resident birds and those that breed in the Algarve Region rather than passing through to other destinations.